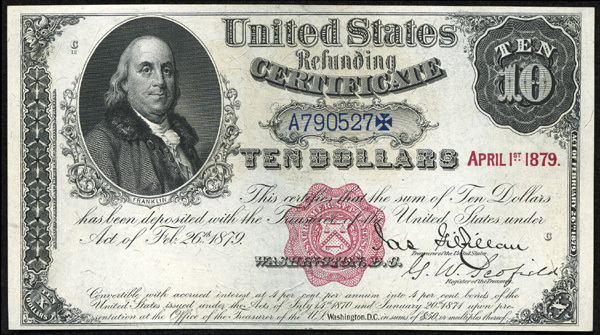 Due to an act of Congress in 1879 the Refunding Certificate was issued. The goal was to make government securities accessible to the public. The denomination was smallish at $10.00, putting the certificate within reach of most anyone. Refunding Certificates were to accrue interest at 4% per year indefinitely. In 1907 Congress passed a bill halting the interest on the refunding certificate. This 1907 act rendered them redeemable for $21.30, the amount of accrued interest + Principal from 1879 to 1907. Refunding certificates paid simple interest so present value would have been $63.20 without the 1907 Act. Refunding certificates are not really collected as a set because there are only two types and one is very rare. 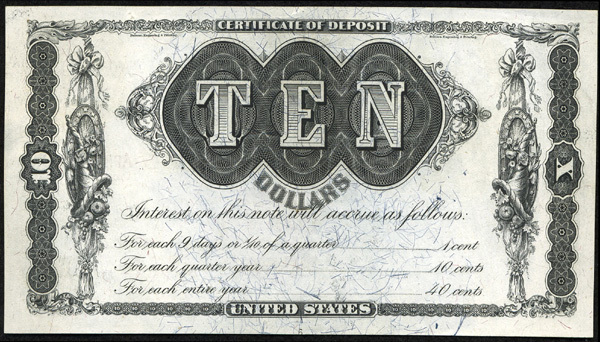 The earlier design had a simple back with a form for the conversion of the note in to a bond. This version of the note is extremely rare. If you own one, contact me for values. The second version of the certificate had a more ornate back and is the one commonly collected today. There are only two known examples of the first type, one is locked away in a Federal collection. The other Refunding certificate is ensconced in the Bass estate waiting to be freed. There are slightly over 150 examples of the second type and it's not a hard note to buy. A mid grade example can cost from $1500 to $2000. A range of values would be from $600 to $14,000 for a Gem.